Manchester City 4-5 FC Barcelona: UEFA Youth League finalists! 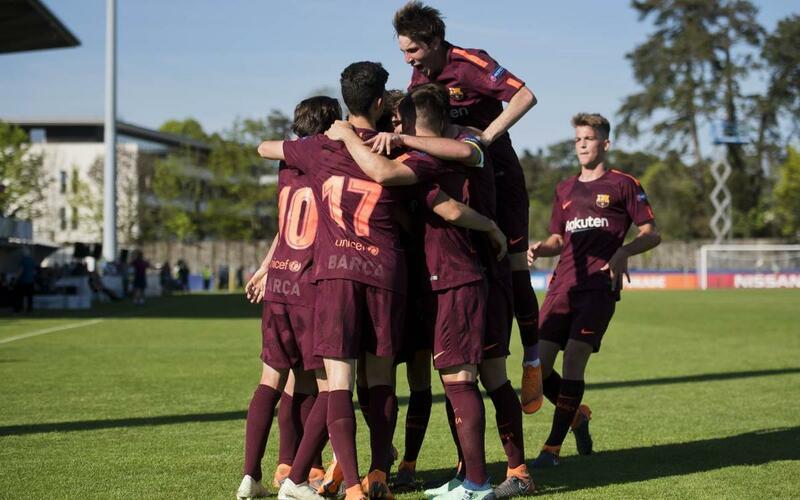 An astonishing five-goal display in the first half of today’s UEFA Youth League semi-final means that Barça will be taking on Chelsea next Monday 23 April at 5.00pm CET in the final of the competition. After the break, Manchester City managed to get back to within one goal but a gripping encounter ended 5-4 to the Catalans, who are looking to win the continental title for the second time. Carles Pérez slipped Barça into the lead after ten minutes, but City soon levelled from a corner. Collado then re-established the lead with a cunningly taken free-kick but the English side once again managed to square things up. But Barça always looked in control, and when Riqui converted a fine Mate cross to go ahead once again, this time the lead would remain intact, boosted by the sending off of Man City’s Swiss striker Lorenzo González. Carles Pérez converted his seventh goal in the tournament and there was still time before the break for Marqués to steal a stray ball and chip it over the City keeper to make it 5-2. The sky blues regrouped after the restart, but their reaction didn’t lead to any goals until there were just 20 minutes left, Matondo setting things up for a tense finish. There was drama all over the pitch, with Carles Pérez hitting the post at one end and Lukas Nmecha then pulling back another for City with five minutes left on the clock. That meant for a truly nail-biting climax, but there would be no further score and the Barça U19 team will now face 2015 and 2016 champions Chelsea in what promises to be a fascinating final on Monday.